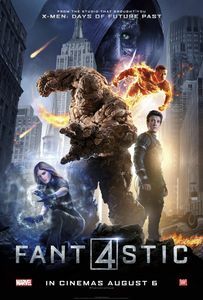 (Netflix Streaming, May 2016) The release of this Fantastic Four reboot was accompanied with wild rumours of a troubled production, an out-of-control director and such vehemently bad reviews that the worst could be expected from the final result. Unfortunately, most of those low expectations are met: Fantastic Four is a mess of a movie, dull and bland in the ways that comic book movies used to be before their formula was perfected, and disjoint to the point of incoherence. The detailed story of the film’s production may or may never be known, but, in the meantime, we’re left with a dour film that rehashes an overly familiar origin story, veers into a generic third act and can’t be bothered to make us care about archetypical characters that, let’s face it, shouldn’t take much work to flesh out. No matter why directory Josh Trank lost control of his film, the result feels botched and hurriedly completed to satisfy contractual obligations: There’s no sense of joy to comic book characters that should exemplify it, and if Fantastic Four very briefly forays into a fascinating body-horror sequence, it quickly forgets all about it moments later. What’s too bad is that it features good young actors who can’t be blamed for the mess: Miles Teller, Michael B. Jordan and Kate Mara, in particular, can’t do much with the featureless material they’re given. (Mara, in particular, is given material fit to make her exceptionally unlikable, which is not how she comes across in other films.) Fortunately, all three have made better movies before and after, so their careers are probably OK. The inanity of the script may be organic or due to studio meddling—it’s hard to tell, but it’s not hard to be disappointed for the results. While some of the most vitriolic reactions to Fantastic Four may be due to frenzied Marvel fan-activism (as in: “Marvel should be doing Fantastic Four films! Let’s hope it tanks so that Fox give the rights back!”), the movie as made available feels like a throwback to fifteen years ago when studios given comic book properties didn’t even bother to treat the material with respect. No surprise is the result is almost instantly forgettable and (as hard as it may be to type this), makes Fox’s previous two Fantastic Four movies look good in retrospect. Strange world. But mark me down as interested if ever “Fantastic Four: The Director’s original vision with unfiltered commentary” ever comes out.